This is a follow-up story with additional details related to my March 25, 2018 article. 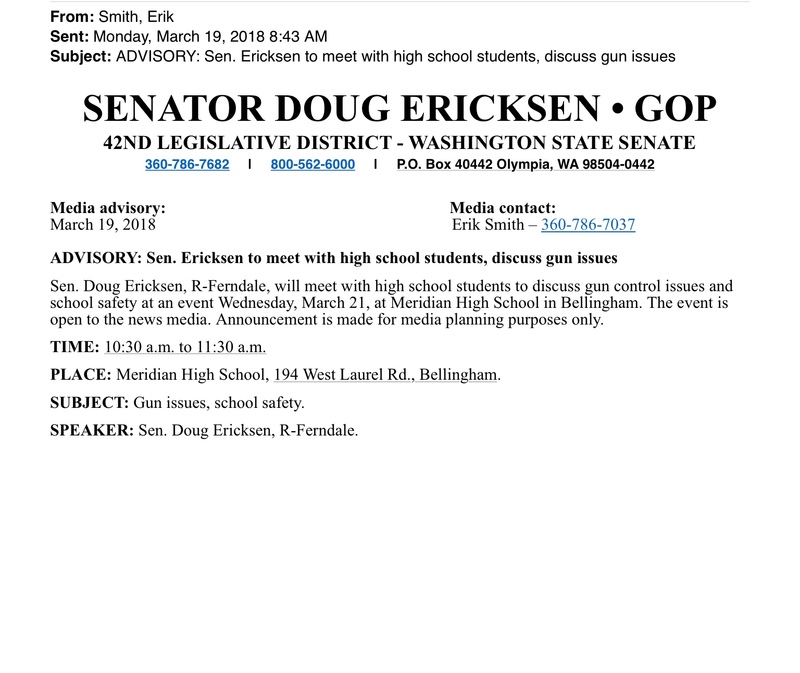 That article had reported on what was known back at that time about Washington state Senator Doug Ericksen’s March 21, 2018 visit to Meridian High School (MHS), as he described it, to talk with students about gun violence and school safety. 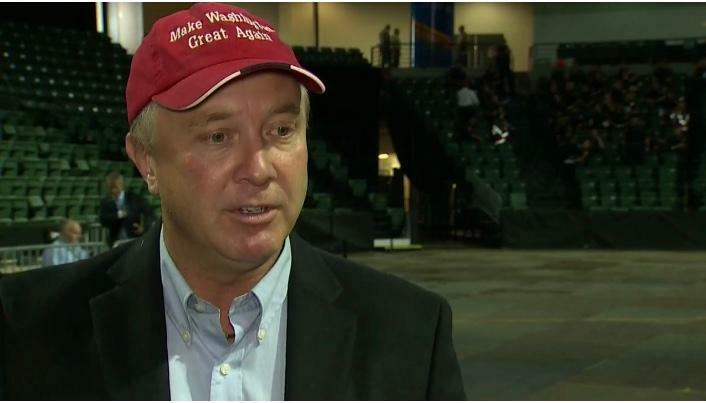 Ericksen, a Republican from Ferndale, Washington, is running for re-election to the state Senate this year. The timing of Senator Ericksen’s March 21 meeting with students at MHS is worth some review. Starting off the new year and new Washington state legislative session with a bang, Senator Ericksen, on January 24, 2018, had voted against the original Senate Bill 5992 (SB 5992) which sought to ban bump stocks. The bill was prompted by the October 1, 2017 mass shooting where 58 people were killed and hundreds injured at an outdoor music festival in Las Vegas, Nevada. Some of the weapons used by the shooter were fitted with bump stocks. Bump stocks are devices legally used to modify and enable semi-automatic weapons, such as AR-15 rifles, to then fire like fully automatic rifles which are illegal in the U.S.
Ericksen was quoted in a January 26, 2018 Spokesman-Review article, “Do you really think the crazy psycho person that sits in a hotel room with a gun and says, ‘It’s against the law in Washington to have one of these so I’m not going to do my crime?’” Eventually, on February 26, 2018, the senator ended up voting yes on the final passage of SB 5992 as amended by the House, and it was signed into law in early March. Senator Ericksen’s March 21 visit with MHS students was held five weeks after the February 14, 2018, mass shooting that occurred at Marjory Stoneman Douglas High School in Parkland, Florida, where 17 students and faculty members were killed, and others were wounded, by a gunman. The senator’s event at MHS took place on the heels of student walkouts on March 14 at some of the local Whatcom County schools which were part of nationwide walkouts in an effort to generate support for stronger gun-control legislation from legislators. Meanwhile, Senator Ericksen has an “A” rating from the National Rifle Association (N.R.A.) which is a stamp of approval from what is considered the nation’s predominate gun advocacy organization. Also, Senator Ericksen’s March 21 event was only a few days prior to the planned, (back at that time) widely promoted and publicized, March For Our Lives event that was held on Saturday, March 24, 2018. Participants in the student-led March For Our Lives joined together to march near the Capitol in Washington, D.C. That week there were also many sister marches which took place across the country and even around the world. Locally, one of those sister marches was held here in Bellingham, Washington, on March 24, with approximately 3,000 participants. Incidentally, Senator Ericksen’s March 21 meeting with MHS students was also roughly two months after the senator had announced he was running for re-election at a press conference he held in Olympia, Washington, on January 8, 2018, the first day of the state legislative session. The senator held the press conference to deliver a vague denial of news reports at that time that he had accepted an appointment to the position of senior adviser to the regional administrator in the Environmental Protection Agency’s Region 10 office, in Seattle, Washington. After writing my March 25 article on Senator Ericksen’s event at MHS, for which, I had limited information, I wanted to obtain additional details so I could write a follow-up piece. From my follow-up seeking more information, I learned that the senator’s office’s inquiries about the possibility of him speaking to students at some of the local high schools about gun violence and school safety were actually made directly to the high school principals, rather than to the school district superintendents. Upon that realization, I contacted the principals at the high schools within Whatcom County to see if all of them had been contacted by Senator Ericksen’s office about potentially coming to the schools to talk with students about gun violence and school safety. From my email communications with superintendents and high school principals from Meridian, Blaine, Lynden, Ferndale, and Nooksack Valley school districts, it appears that a staff person from Senator Ericksen’s office contacted the high school principals, via telephone, inquiring about the possibility of the senator coming to talk with students about school safety and gun violence. Those inquiries occurred sometime during the week of March 12th, and/or possibly sometime during the week of March 5th. According to my email communications with school district superintendents and high school principals, Senator Ericksen’s office had contacted all of the high schools within Whatcom County except for high schools in the Bellingham School District, and Mount Baker High School. The school administrations of Blaine, Lynden, and Nooksack Valley high schools decided not to pursue/schedule that activity proposed by the senator. From my email communications with Ferndale School District Superintendent Linda Quinn regarding Senator Ericksen’s office’s inquiry back in March about the possibility of him coming to speak to students about gun control and school safety, it is unclear whether the school district/Ferndale High School responded to the senator’s request at all, or whether the school district/high school decided not to have the senator come talk to students. I contacted MHS Principal Derek Forbes, via phone, the day after Senator Ericksen’s March 21 event at the high school. He told me that the senator’s office had contacted the school and asked if Senator Ericksen could meet with a panel of students to hear their thoughts and concerns on school and student safety, and gun control. Principal Forbes said that Senator Ericksen/his office left the format for that visit up to his (the principal’s) discretion. Due to what Principal Forbes described as short notice given by the senator about his desired visit, the principal decided to have the meeting with students during the school’s support period, called the T3 period, which then limited the visit with Ericksen to that particular period. 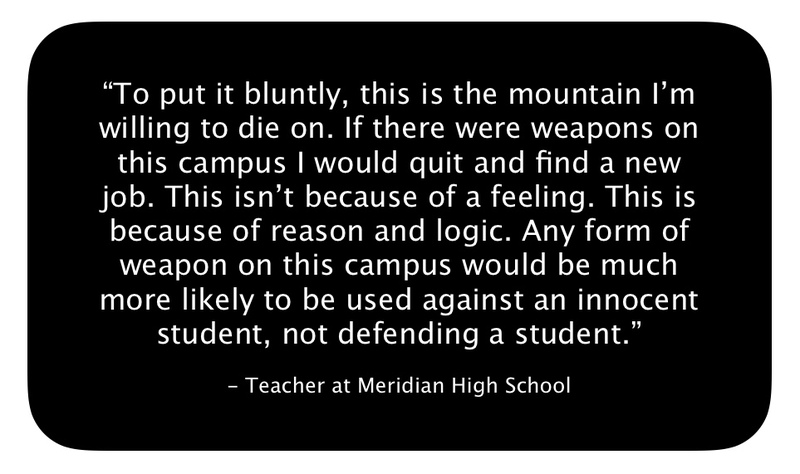 Principal Forbes also told me during our March 22 phone call, that he asked MHS teachers to select any students which they felt might have strong feelings about the issue of gun control, who would want to participate in the discussion. Forbes said he additionally announced, at two school lunch periods, the senator’s then-upcoming visit, asking for any students who were interested in participating. There were approximately twenty MHS students total who participated in that March 21 event with Senator Ericksen. Public records I obtained from the Meridian School District show that Principal Forbes sent a March 20, 2018 email (at 6:38 AM) to all Meridian High School teachers, letting them know that he still needed names of any students who the teachers believed should contribute to the conversation with Senator Ericksen. According to email records provided, several teachers responded to Principal Forbes and provided him with some names of students as potential participants for the senator’s March 21 event. 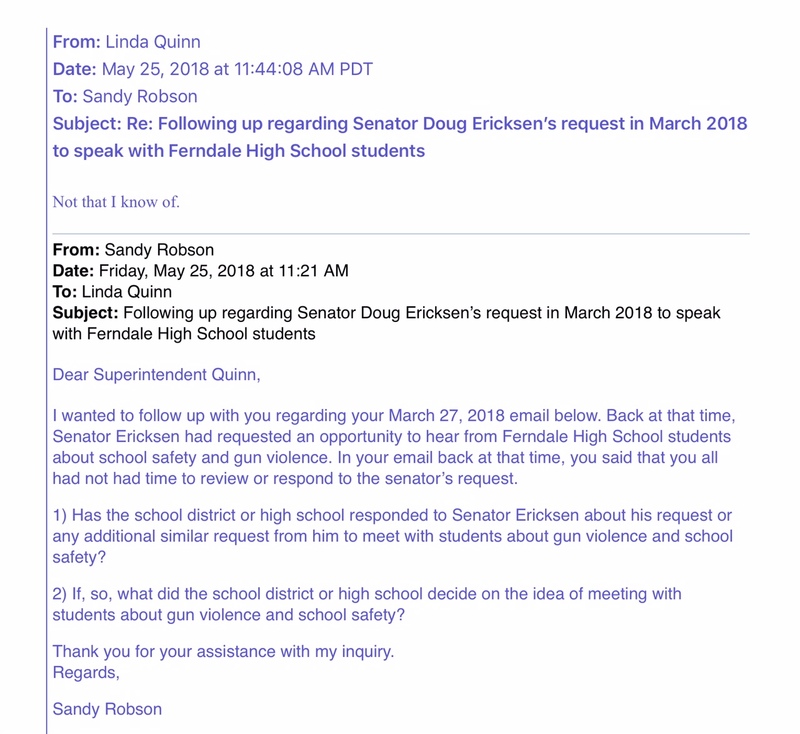 Records indicate that Senator Ericksen’s office staff person, Sandy Ruff, contacted MHS, via telephone, a few days before the Wednesday, March 21 meeting, and spoke with the Head/ASB Secretary, asking if the school was willing to have media present at the meeting with students. After checking with Principal Forbes, the head/ASB secretary let the senator’s office know, via telephone, that it would be okay to have media present at the event. It appears that Senator Ericksen’s office arranged everything regarding his visit via telephone, as there were no written communications between the Senator’s office and Meridian High School personnel contained in the records provided me. Superintendent Churchill told me in a March 27 email, that he found out that a media advisory inviting the media to attend had been sent out the day before the March 21 Senator Ericksen event. According to a copy of the media advisory I obtained from Senior Information Officer for the Washington State Senate Republican Caucus, Erik Smith, the media advisory was sent, via email, to various news media outlets on Monday, March 19, at 8:43 AM. Mr. Smith was the individual who sent out the media advisory for Senator Ericksen’s event, and he was listed as the “Media contact” on that notice. King5 News, KIRO 7, The Bellingham Herald, and the Lynden Tribune came to MHS to cover the event. 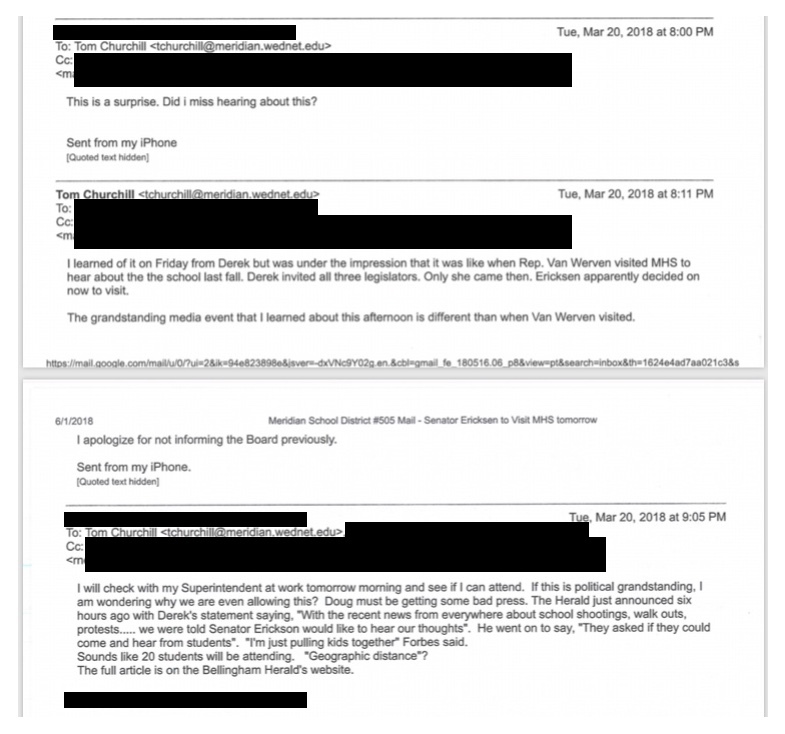 A board member responded to the superintendent’s email later that evening on March 20, and said Senator Ericksen’s event was a surprise to him, and asked how he missed hearing about it. Superintendent Churchill responded later that same evening in an email (Ccd to the board), and explained that he learned of the event on Friday, March 16, from the principal, but had been under the impression that the visit was going to be similar to when Washington State Representative Luanne Van Werven (R-Lynden) visited MHS last fall to hear about the school, when Principal Forbes had invited all three state legislators who represent Whatcom County. Apparently, Representative Van Werven was the only one to accept the invitation and come to the school. On March 20, the day before Ericksen’s meeting with MHS students, The Bellingham Herald published a story about the senator’s then-upcoming visit to MHS, titled, “While everybody’s talking about gun violence in schools, he’s visiting to listen.” The article reported: “Ericksen, a Ferndale Republican, said his plan was to start a discussion and then listen. Why is a state senator who claims he was meeting with high school students in order to listen to their concerns about gun issues and school safety, then taking the opportunity to deflect from, or minimize, the glaring reality that in the U.S., the list of shooting incidents at schools resulting in injuries and deaths is ever-growing? There have been additional shooting incidents at schools since the February 14, 2018, mass shooting at Marjory Stoneman Douglas High School. On May 18, 2018, there was a mass shooting event at Santa Fe High School in Santa Fe, Texas, where 10 students and teachers were killed, and 13 people were wounded. There was also a shooting incident on May 25, 2018, at Noblesville West Middle School in Noblesville, Indiana, where a teacher and a student were wounded. Senator Ericksen’s decision to have local news media alerted to his March 21 visit to MHS, appears to contradict the senator’s claim that he simply wanted to listen to students’ concerns about gun violence and school safety. Therefore, it’s regrettable that when MHS Principal Forbes learned a few days prior to the March 21 event that Senator Ericksen wanted to invite news media to attend the event, he did not tell the senator that it would not be appropriate to have news media attend what was billed as a listening session with students. Posted in Commentary, Information and tagged Derek Forbes, Doug Ericksen, Ferndale School Superintendent, Gun Violence, King5, KIRO 7, Linda Quinn, March for Our Lives, Marjory Stoneman Douglas High School shooting, Meridian High School, Meridian School District, National Rifle Association, November 2018 Election, NRA, Sandy Ruff, Senator Doug Ericksen, The Bellingham Herald, The Spokesman Review, Tom Churchill, Washington State Legislature, Washington State Senate, Whatcom County. Bookmark the permalink.